This chapter highlights some aspects of the contribution of TA to enhancing environmental performance. The main objectives of this chapter are to highlight aspects related to the TA and its implications for its use as an efficient method in ensuring decision support in the environmental reports of an economic entity. This implies the transition to a larger geographic scale of national economies and, implicitly, the global economy, from a linear economy to a circular economy that should not only involve the recycling of resources but also the green reporting requirement. All aspects presented by the authors are based on the existing specialized literature, university studies, and specialty from all over the world. A new conceptual and empirical framework has been developed as a result of the issues debated and presented by the authors, whose purpose is to extend the knowledge of specialists from all over the world, as well as challenging other equally interesting new research themes. From the proposal of productivity accounting by Goldratt et al. (1992), its concept and principles were promoted by CIMA and also appear in the studies of some specialists who define it as: a method of measuring performance that refers to production and other costs of production capacity. The cost of production capacity accounting products refers to the use of key resources by various products (CIMA, 1991; Drury, 1992; Yoshikawa et al., 1993; Bromwich and Bhimani, 1994). Productivity accounting evolved as an emerging accounting practice aimed at improving profitability by taking into account constraints that impede production capacity (Boyd and Gupta, 2004; Ali and Dubey, 2010). There are many managerial accounting techniques available to help managers in decision-making on various planning, assessment and control activities (Cokins et al., 2001). Part of the managerial accounting collects costs and assigns them to various activities or products through various methods such as: Activity-Based Costing (ABC), Process Costing, Standard Costing, Kaizen Costing, TA and others (Boyd and Cox, 2002). By adapting the TA concept to these methods, managers can identify the most cost-effective method of costing and can make more effective decisions. The only concern of managers is to identify that accounting technique that provides accurate information on product cost, maximum profit and customer service, including cost-effective product mix decisions (Lea and Min, 2003). Specialist studies focused on constraint accounting (TOC) to maximize the profits of a company, using TOC to finance a Supply Chain (Mateen and More, 2013). Considered as a smart business method, productivity accounting is often used as a tool for increasing performance and maximizing corporate profits. As an internal reporting tool, productivity accounting has a dual role: (1) practical and effective where needed; (2) helps to substantiate and make better decisions from the company’s management based on three components: production capacity, inventory and operational expenses. Activity-Based Costing (ABC): An accounting method that identifies the costs of the (indirect) activities and then allocates these costs to the products. Allocation of product costs to products is done through cost drivers. Climate Change: Significant change in mean values of a meteorological element, especially air temperature and rainfall, for a period of at least 10 years with an impact on the economy, society, and the environment. Green Reporting (GR): Report on the financial situation of a company based on information on costs and environmental indicators. 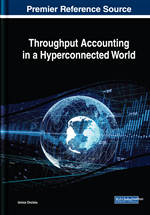 Throughput Accounting (TA): Integrated system based on principles used in management accounting for performance measurement through theory of constraints (TOC). Decarbonization of the Economy: Economic and social activity to reduce and eliminate carbon emissions in the environment to improve its quality.